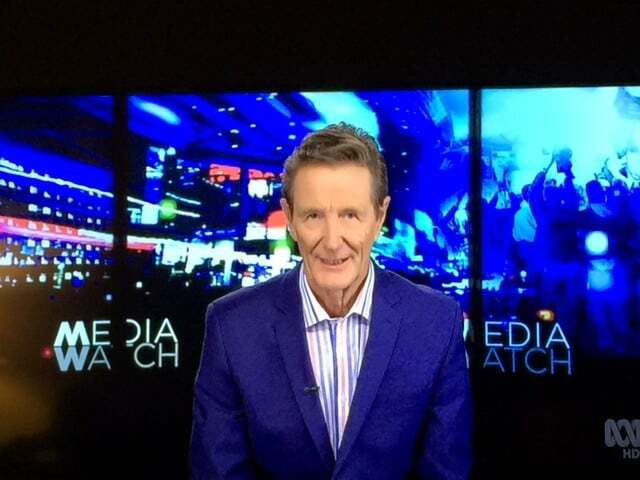 Paul Barry and Media Watch: media "should not be allowed to make the claims unchallenged"
Introduction by Melissa Sweet: Earlier this week, ABC TV’s Media Watch program demolished much mainstream media coverage of new codes of conduct for nurses and midwives. 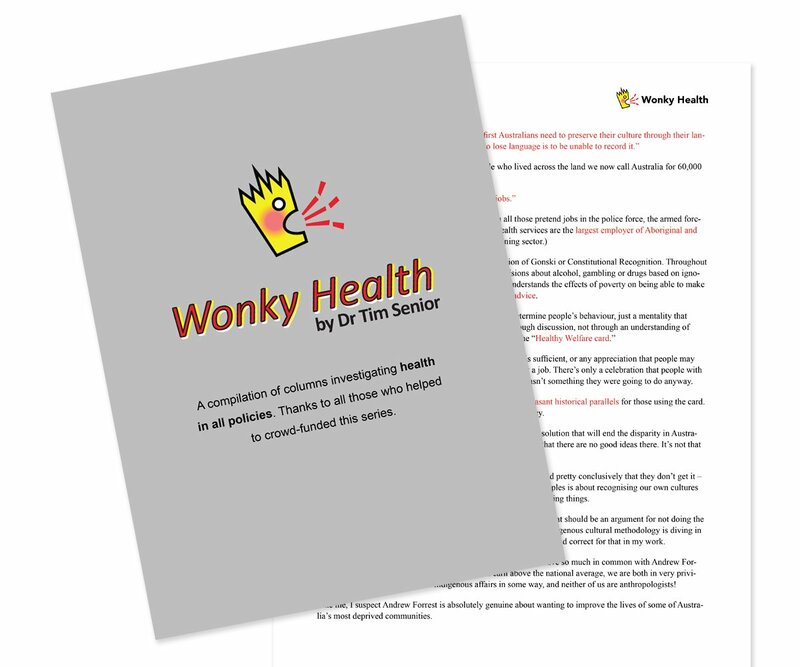 The program reported that many outlets – including Sky News, Today Tonight in Adelaide, Radio 2GB and the Cairns Post, Daily Telegraph and Daily Mail newspapers – had published misinformation whose veracity could easily have been checked with a quick online search. Such a search – the codes of conduct are available from the Nursing and Midwifery Board of Australia (NMBA) website – would have disproven claims that the codes’ requirements around cultural safety compel white nurses and midwives to declare and apologise for white privilege when treating Aboriginal and Torres Strait Islander patients. While the Media Watch program was useful in correcting the public record, host Paul Barry’s suggestion that concepts such as white privilege could be seen as “pretty barmy stuff” is a reminder that such concepts are poorly understood by the general public and even investigative journalists. 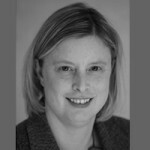 Perhaps this recent fracas is an opportunity for some public education, suggests Elissa Elvidge, a PhD candidate with the School of Medicine and Public Health at the University of Newcastle, who explains below why she is developing an empirically based framework for Aboriginal Cultural Safety and Security for NSW hospitals. (And also see some further Twitter discussions beneath her article). As a scholar of cultural safety, I set up a Google alert service in 2015 to help keep me in touch with related discussions, in the media and more widely. Usually a notification lands every two months or so – cultural safety is not often a headline issue. But in the past fortnight, the number of notifications has increased dramatically. Regular Croakey readers will understand that a politically motivated campaign based on misinformation and faux moral panic has driven much of this discussion. At the same time, health leaders – including the Congress of Aboriginal and Torres Strait Islander Nurses and Midwives (CATSINaM) and other nursing and midwifery groups, the Australian Indigenous Doctors Association, and other peak health groups have spoken up for the importance of cultural safety for improving care and outcomes for Aboriginal and Torres Strait Islander people. 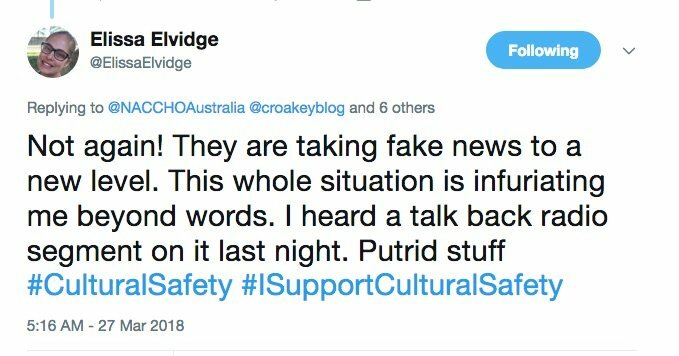 Given the heightened public focus on an important concept that does not usually get much airtime, it is timely to take the opportunity to provide further information about cultural safety. Cultural safety is not about declaring white privilege to each patient or requiring nurses (or anyone) to apologise for being white. The term was first coined and defined by the late Irihapeti Ramsden (who was a nurse!) as “an environment, which is safe for people, where there is no assault, challenge or denial of their identity, of who they are and what, they need”. A culturally safe model of care requires that the perspectives and worldviews of the people represented (i.e. patients; no mention of race, skin colour or ethnicity) must be integrated into all facets of service provision, from program development to service delivery. Cultural safety emerged in the late 1980s in general use in Indigenous health. However, the term is also applied to other marginalised groups who were differentiated from the dominant culture on an basis other than race or ethnicity, including age, socioeconomic status, gender, sexuality and disability. Cultural safety reinforces the importance of establishing rapport, trust and empathy with patients and their families – surely these are core values that any nurse or health practitioner should have. Initially, cultural safety was developed and adopted as part of nursing practices. However, since its inception it has been applied widely in disciplines such as social work, occupational therapy, education and more broadly in health promotion and health policy, as well as the legal system. You wouldn’t think so with the commentary we’ve seen recently, but cultural safety has been an important part of the national nursing and midwifery curriculum for years. 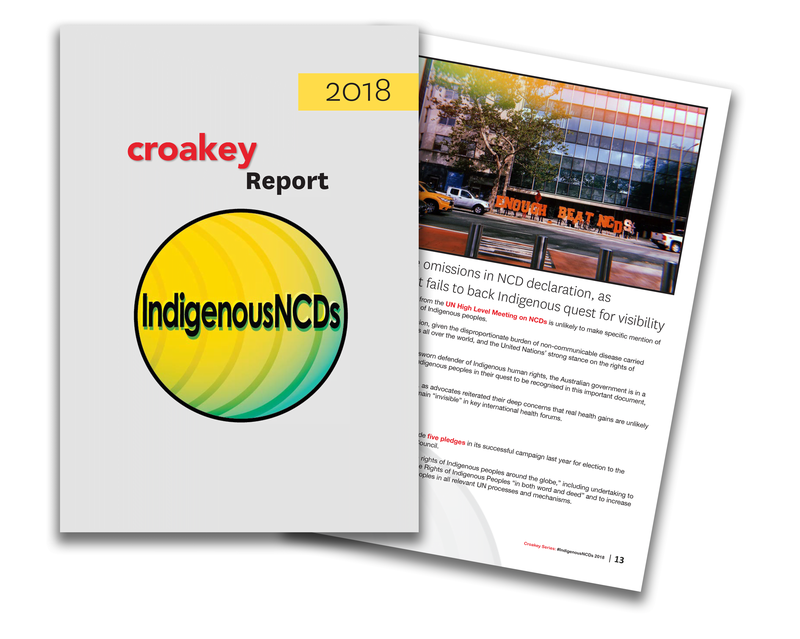 This presence in the curricula has not emerged in isolation, with several national and state health policies that recommend creating culturally safe health services for Aboriginal people as one way of addressing health disparities. These include the National Aboriginal and Torres Strait Islander Health Plan 2013–2023, the United Nations Declaration on the Rights of Indigenous Peoples, and the Hunter New England Local Health District Strategic Plan Towards 2017. In the Australian Government Implementation Plan for the National Aboriginal and Torres Strait Islander Health Plan 2013–2023, several sections incorporate aspects of Aboriginal cultural safety and security in an effort to achieve health equity by 2031. In an effort to increase access to services, the plan includes strategies such as “reducing racism and discrimination and improving the cultural safety of the mainstream health system”. The National Safety and Quality Health Service Standards (NSQHSS) are another excellent example of how the government has placed priority on closing the gap. 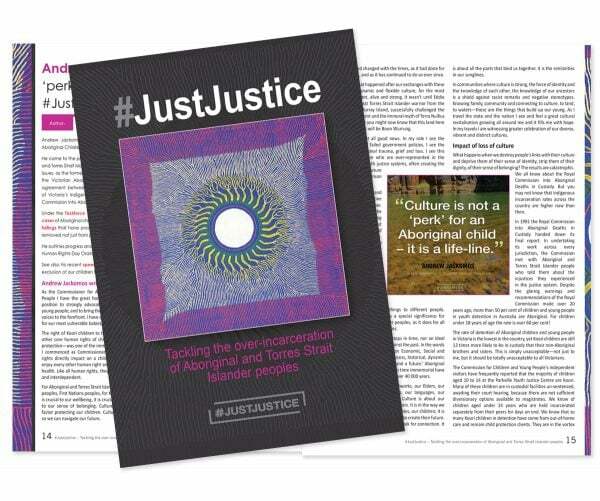 The current version of the standards includes strategies for improvement such as creating a culturally safe environment for Aboriginal and Torres Strait Islander people who use the organisation’s services. 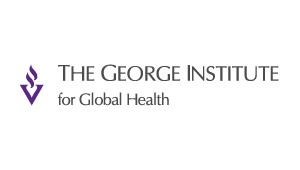 International research highlights the importance of incorporating culture into health care governance and acknowledges that the integration of culture is one of the contributing factors in closing the gap in Indigenous health disadvantage. Countries like New Zealand, Canada and the USA are far more advanced in integrating culture through cultural safety and cultural competency into their health care systems (see references from NZ and the UK, for example). In New Zealand, cultural safety has been part of the compulsory nursing and midwifery curriculum for over 20 years. The Nursing Council of New Zealand (Health Practitioners Competence Assurance Act 2003) has put in place a set of practice standards and professional competencies that nurses must meet as part of their initial registration and ongoing professional development. Under the standards, nurses must be able to apply the principles of cultural safety and demonstrate that they are practising in a way the patient deems to be culturally safe. Since their introduction, the standards have had a major impact on nursing practices and the overall delivery model of health care in New Zealand. Another international best practice model for Indigenous cultural safety can be seen in the Accreditation Canada’s Standards for Aboriginal Community Health and Wellness. These standards were developed using a family-centred framework in partnership with patients and their families to provide respectful, compassionate, culturally safe and, competent care whilst being responsive to cultural identity, needs, values, beliefs and preferences. Despite these international success stories, cultural safety in Australia continues to be “poorly understood and the subject of ongoing controversy, conflict, and confusion about how it should be defined, interpreted, and implemented in health and nursing care contexts”. 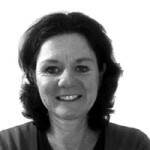 The comparably better health status of Indigenous peoples from New Zealand and Canada could in part be a reflection of how, over time, the legislative and health service standards that incorporate the culture and health needs of their Indigenous populations have been one way of effectively addressing health inequality. 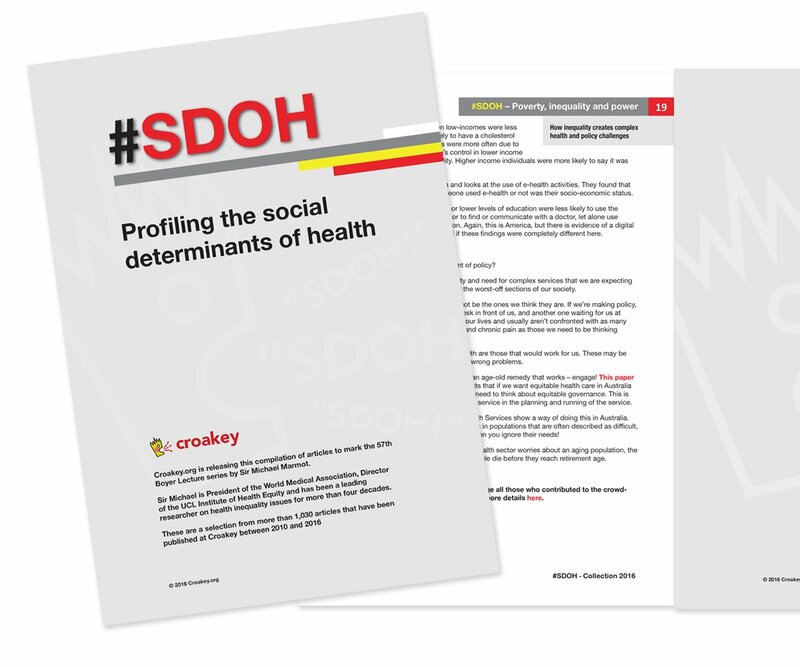 In Australia there is a lack of consensual definition at the policy level of what constitutes culturally safe health services for Aboriginal people. 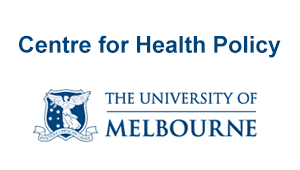 Integrating research into health policy and hospital governance poses a significant challenge for academics, governments and health service organisations. The policy integration of Aboriginal culture and strategies aimed at reducing health disparities are constrained by both the need for more research on what constitutes successful close the gap strategies and the translation of evidence into effective policy actions. My research aims to bridge this gap by developing the first empirically based framework for Aboriginal Cultural Safety and Security for NSW hospitals. The methods include interviews with hospital staff and a survey of Aboriginal patients and families that measures cultural safety from the patient perspective. 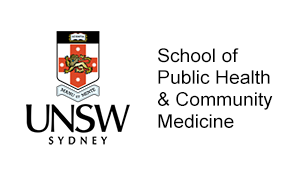 Once the resulting framework is validated and finalised, it will be used to inform subsequent research methods, as well as the development and evaluation of future culturally based programs aimed improving access and acceptability of health services for Aboriginal people. In order to achieve this, my study will seek to address key gaps in current knowledge about cultural safety and the scarcity of empirically based research on reducing Aboriginal health inequality. If we were to reflect on this mainstream media coverage from a cultural safety perspective, it could be viewed as a teachable moment and an opportunity to inform the public about the real meaning and significance of cultural safety in healthcare. AHPRA, CATSINaM, ACM, ACN and AMNF should be applauded for their leadership in the development and joint support of the codes of conduct. If you would like to find out more about the codes and cultural safety, some excellent evidence-based articles and opinion pieces are available to counter the rhetoric being spread. 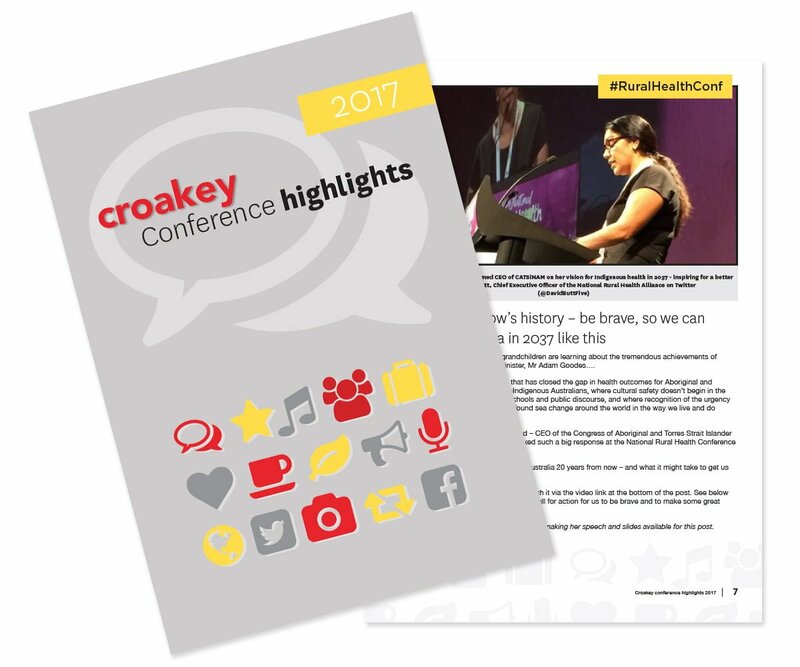 See previous articles at Croakey by Dr Ruth DeSouza and Associate Professor Lynette Cusack; articles at IndigenousX by CATSINaM CEO Janine Mohamed and Luke Pearson, and this article at NITV by Summer May Finlay. 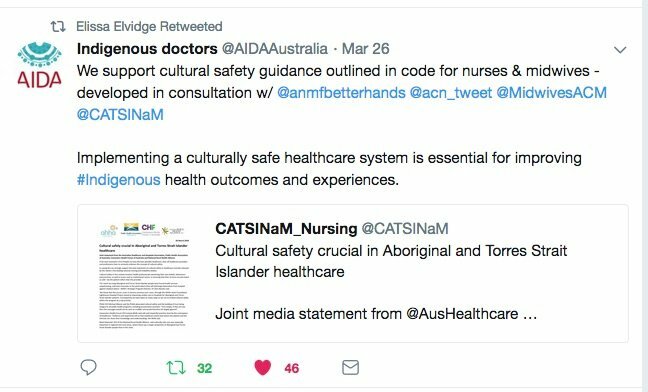 Please share these stories, and if you are a nurse, midwife or health professional who does support cultural safety, please tweet #NursesSupportCulturalSafety or #ISupportCulturalSafety. 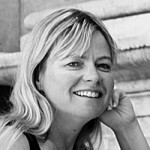 • Elissa Elvidge is a PhD candidate with the School of Medicine and Public Health at the University of Newcastle. Before starting her studies, she worked in public health on HIV health promotion, influenza surveillance and in cultural redesign. 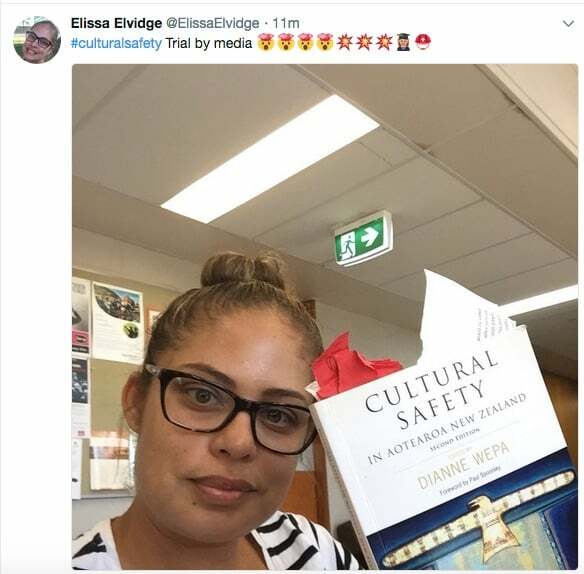 To find out more about her research, please contact her and the research team via Twitter on @ElissaElvidge and follow related coverage on #CulturalSafety. 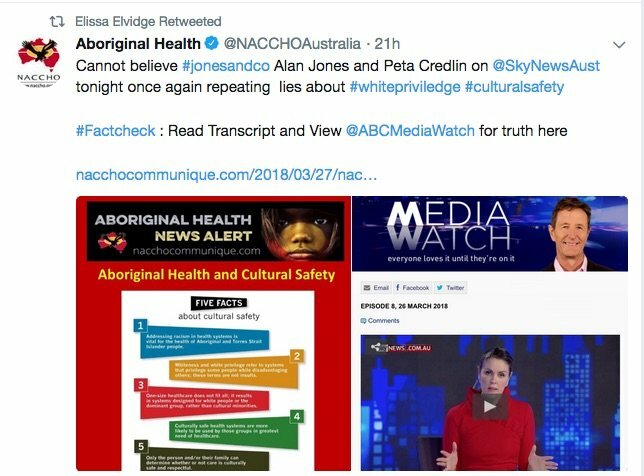 At least one News Ltd journalist, Rohan Smith, has now sought to correct the record; however, Peta Credlin, Alan Jones et al seem set to continue attacking efforts to improve healthcare for Aboriginal and Torres Strait Islander people. 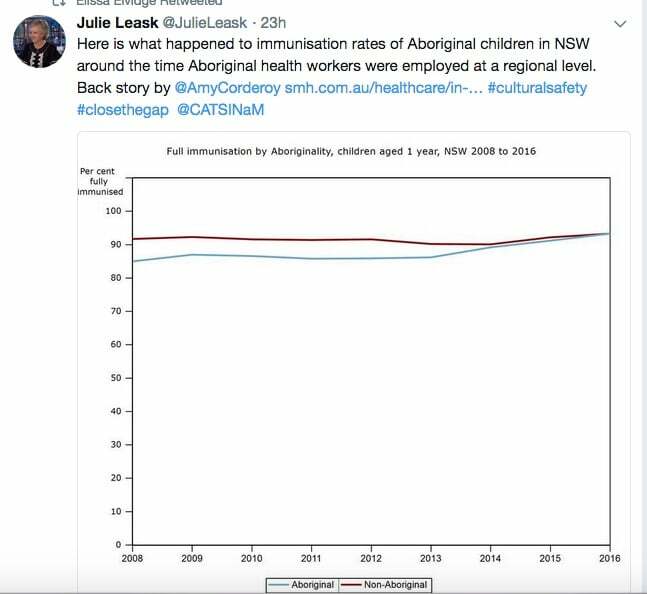 Meanwhile, Associate Professor Julie Leask from the University of Sydney has tweeted on the importance of cultural safety for improving immunisation rates and the quality of services. 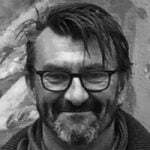 The publications cited by Leask are available here and here. 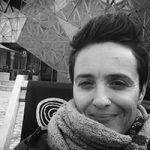 Read this article, and watch these interviews from the CATSINaM conference last year with cultural safety scholars Ali Drummond and Dr Leonie Cox.